This is an excerpt from Mountaineering edited by Carlton Cooke, Dave Bunting and John O’Hara. Strength and power are two vital factors for successful performance in activities such as mountaineering, climbing, and cross-country skiing. However, supporting evidence for the importance of strength and power in these activities is mainly anecdotal. 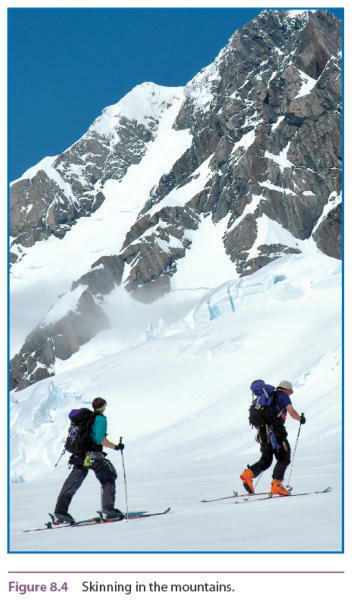 To our knowledge, there are few, if any, well-designed training studies that have looked at the effects of training protocols on mountaineering and climbing. An overview of key findings in the following paragraph provides support for the importance of strength (upper and lower body) in rock climbing, mountaineering, ski mountaineering, and cross-country skiing. Good muscular endurance and strength of the arms and shoulders are beneficial for climbing. Research has shown that success in climbing performance is best explained by trainable variables such as shoulder strength and endurance, forearm strength and endurance, and maximum grip strength, rather than anthropometric characteristics such as height and weight (Giles, Rhodes, & Taunton, 2006; Mermier, Janot, Parker, & Swan, 2000). Low body-fat percentage, low body mass, and a positive ape index traditionally have been perceived as beneficial in rock-climbing performance (Watts, Martin, & Durtschi, 1993). However, the majority of research suggests that low body mass, low body-fat percentage, and a positive ape index are not necessarily prerequisites for rock-climbing performance (Giles, Rhodes, & Taunton, 2006; Watts, 2004; Sheel, 2004). Mermier and colleagues (2000) in particular found that training variables such as knee extension and flexion, shoulder extension, and grip strength and endurance explain approximately 59 percent of the total variance in climbing, whereas anthropometric characteristics and flexibility explain 0.3 percent and 1.8 percent of the total variance. In cross-country skiing, upper-body strength and quadriceps strength have been found to be good determinants of race performance, whereas strength of knee flexors has not (Ng et al., 1988). Upper-body strength in particular has been shown to improve performance in cross-country skiers mainly by improving work economy (Hoff, Gran, & Helgerud, 2002; Hoff, Helgerud & Wisloff, 1999). Ski mountaineering performance during uphill skiing seems to be highly correlated with the strength of knee flexors (Voutselas, Soulas, & Kritikos, 2005). The different findings between the studies by Ng et al. and Voutselas et al. are more likely attributable to the inclination of the ground. 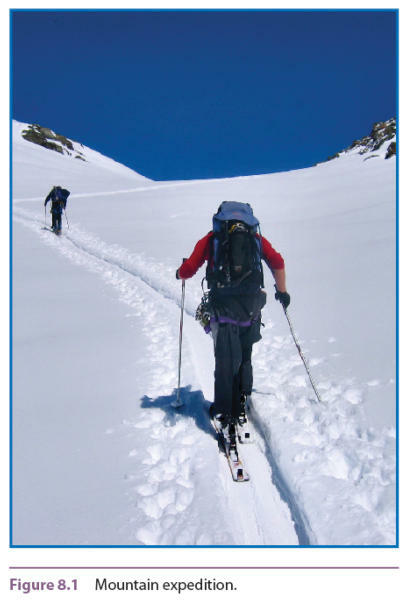 It seems that improved ski mountaineering uphill is directly linked with the strength of knee flexors. The latter finding emphasizes the importance of strengthening the knee flexors in order to maximize performance for this activity. Another important finding is that absolute strength of elite climbers and the general population does not differ, but relative strength is better in climbers than nonclimbers (Giles, Rhodes, & Taunton, 2006). Thus, it has been suggested that low body mass might improve rock-climbing performance. Similarly, during ski mountaineering, low body mass index (BMI) is highly correlated with performance (Voutselas, Soulas, & Kritikos, 2005). Maintaining a low body mass in order to improve relative strength and performance might not necessarily be the best option for mountaineers and climbers. Also, the fact that mountaineers who attempt to climb mountains such as Everest tend to lose up to 7 percent of their body weight during an expedition suggests that weight loss before an expedition might not be desirable (Wiseman, Freer, & Hung, 2006). A better alternative to increase relative strength and thus performance might be an increase in maximum strength rather than a decrease in body mass. Gains in maximum strength would in turn increase relative strength, provided the gains in muscle hypertrophy are minimal or of smaller magnitude compared with strength gains. Anecdotal evidence and climbing literature suggest that climbers in particular believe that a decrease in body mass and a specific training regime that imitates climbing activities are the best ways to improve performance in rock climbing. Even though the importance of technique-specific training and low body mass should not be underestimated, the traditional belief that specific training and a decrease in body mass are the best ways to improve performance can be challenged. Regardless of the fact that rock climbing is a highly technical event, if athletes are not strong enough, they will not be able to hold a particular position for the same length of time as athletes who have equally good technique but are stronger. In an ideal world I’d like to do weights twice a week. I think that young people worry too much about training and don’t climb enough. . . . In the early days I’d climb, climb, climb. Such training does not seem to be the case with the majority of climbers, who seem to be narrowly focussed on technique and using extra weights whilst climbing. Imagine a coach who coaches athletes in pole vault and asks them to wear weighted jackets in order to improve strength, power, and potentially jumping performance. Sole use of such a method would be questioned by high-performance coaches, and they would not adopt it for important reasons: There are better ways to improve relative strength and power than body weight and addition of weight during an activity and the risk of injury and accident would greatly increase, particularly for athletes who are weaker and inexperienced. We propose that alongside improvement in climbing technique, a strength and conditioning programme is important to improve rock-climbing performance at all levels. We do not seek to undermine the importance of climbing technique that should be taught from the initial stages of training, but we believe that the gains associated with a structured strength and conditioning programme are too often overlooked. Even for the experienced climber, a strength and conditioning programme would be beneficial. Climbers who have previously used more specific training activities, such as campus boards and fingerboards, but have found performance plateauing can use weight training to shock the system and help break that performance ceiling. A cycle of strength training can also provide the key to a climber who, for example, may simply lack the physical strength to perform the crux move on a route but has sufficient endurance to get to the crux every time. The relationship between strength and muscular endurance is demonstrated with an example comparing the strength and muscular endurance of twins. Identical twins both have a mass of 80 kilograms (176 lb). However, one of the twins (A) can lift 160 kilograms (353 lb) during 1-repetition maximum (1RM) strength testing of the bench press whereas the other twin (B) can lift 70 kilograms (154 lb). Which one can do the most press-ups? See table 8.1 for the mathematical solution using the estimated number of repetitions based on 1RM strength. From an energy expenditure perspective, when twin B is doing the press-ups at 100 percent effort, twin A is doing the press-ups at 50 percent maximal effort. The stronger twin would be able to lift his body weight 44 times more than the weaker twin. The estimated number of repetitions was worked out using prediction tables (Baechle, Earle, & Wathen, 2000). This relationship is equally important for several strength exercises in the gym (see sample programmes later in the chapter), which can increase the capacity to perform more repetitions in climbing-specific movements. Increase in maximal strength (or increase in capacity to produce force) means that submaximal efforts become more efficient (i.e., less energy cost for the same amount of work). Becoming more efficient helps climbers and mountaineers not only by conserving energy, which is vital in extreme conditions, but also by decreasing the risk associated with mountaineering and climbing activities. Safety is of paramount importance in extreme conditions. People who use a higher percentage of their maximum strength at high altitude are not only likely to lose balance and coordination but are also more likely to be fatigued as a result of excess energy consumption. As well as increased safety at altitude, the greater efficiency in energy consumption would mean a greater reserve for the traditional climber pushing for the on-sight flash at a new grade or reducing the risk factor when the climbing is loose or bold. For the sport climber or boulderer, it would mean more attempts at the route in a single session. Regardless of the types of activities that take place during a mountain expedition (figure 8.1) or a rock-climbing expedition (figure 8.2), the evidence clearly suggests that strength gains can improve performance. The strength and conditioning programme should not be viewed as a replacement for climbing but rather as supplementary. It is possible to do a weight training session after climbing, provided that the climbing was more finger orientated and not overhanging (Gresham, 2004). Maintaining a climbing programme during the strength programme is important for transferring the increased levels of strength and power into greater climbing performance. Unless you’re an experienced climber, the best way of converting the pure strength gains into climbing gains is through bouldering (figure 8.3). 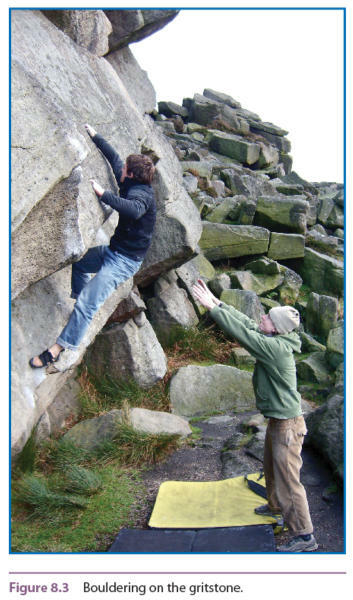 By combining bouldering sessions with a weight training programme, technique and strength can develop together. Experienced climbers may wish to combine a strength and conditioning programme with system boards and system training, along with campus boards and fingerboards. However, care is necessary to avoid overloading the body during this phase of training. 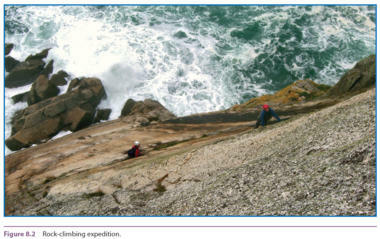 It is not in the scope of this chapter to discuss implementation of system training and the detailed use of campus boards, but excellent online articles are available that give advice on these training activities (for example, see www.moonclimbing.com, www.davemacleod.com, and www.planetfear.com). Mountaineers and ice climbers would benefit greatly by adopting a strength and conditioning programme as part of their preparation for the winter season or an expedition. In particular, the development of strength and power in the legs is useful for activities such as skinning (figure 8.4). The strength of knee flexors and extensors, shoulder girdle, and grip are considered important for successful performance in mountaineering and climbing activities. The proposed resistance training programme presented in a subsequent section will therefore primarily focus on developing the strength of muscles involved in these movements.